Last week I learned from owner/brewmaster Craig O’Herron that Sideswipe Brewing is about to release their fifth beer, a “pumpkin ale” brewed with butternut squash and called Squashing Pumpkins. According to Craig it’s possible to get more “pumpkin flavor” in a beer by using squash instead of actual pumpkins. To the best of my knowledge I’ve never tried a squash beer so I can’t vouch for the validity of this statement, but I plan to go to the taproom this Thursday to see for myself. Anyway, the impending release of the aforementioned squash beer reminded me that I have yet to write a review of their previous seasonal release, the hoppy American wheat ale Pixelated Sun. I know it is late in the coming, but at least this review is hitting the presses before the leaves start falling from the trees. As of last week bottles were still on the shelves (at least at Weiland’s Market). Worshiped as a god in ancient times, its warm glow still warrants celebration in modern days. This light, straw-colored wheat beer is infused with Citra hops, giving it an invigorating, citrusy and hoppy finish. It’s perfect for saluting the solar deity above from the comfort of your lawn chair. Praise the sun. Many wheat beers are unfiltered and hazy, but Pixelated Sun is crystal clear. The golden colored liquid, appropriate for a beer named after the sun, is topped by 3 fingers of white head that presumably symbolizes the fluffy cumulus humilis clouds you see on a fine summer day. The nose suggests a classic American IPA—grapefruit, pine, and a touch of sweetness from the wheat malts. The taste is crisp and refreshing. The citrus flavors from the Citra hops accentuate the subtle lemony flavors I normally associate with an American Wheat Ale. There is a little bitterness at the finish, enough to keep the sweetness from the malts in check but not so much that it detracts from the easy drinking, thirst quenching experience. To get this amount of hop aroma and flavor coupled with a rather moderate amount of bitterness I would guess that quite a bit of dry hopping went into making this beer. The mouthfeel is smooth, bordering on creamy, undoubtedly from the wheat. 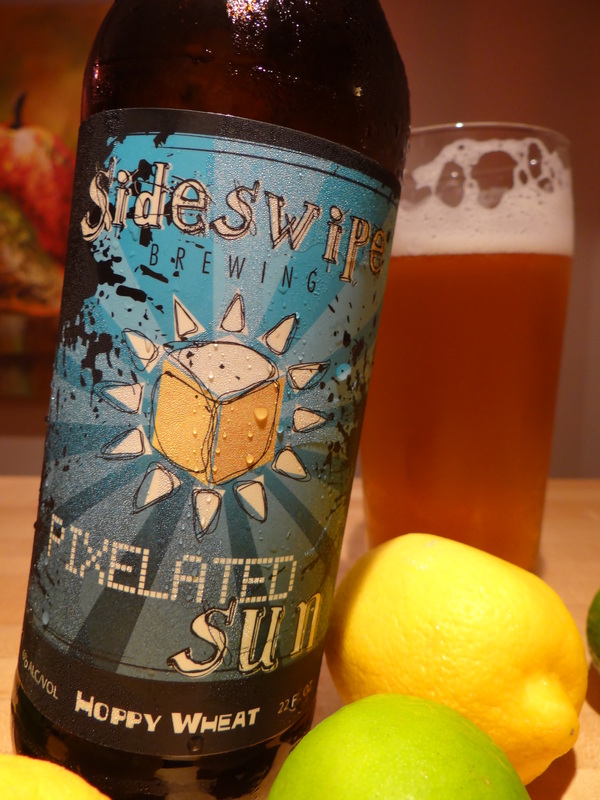 I’m consistently impressed with the quality of Sideswipe beers and Pixelated Sun is no exception. If you’ve been reading my reviews long enough you’ll know that I don’t feel all styles of beer benefit by adding a bunch of American hops, but here Sideswipe has managed to take some of the best things in an IPA and a wheat beer and combine them in a single harmonious union. I don’t think people are going to clamor over this beer the way they do Three Floyd’s Gumballhead, but maybe they should. Even though the really warm days of summer are behind us, the sunny days hopefully are not. So grab a bottle of this beer while you still can and pair with the gorgeous days of early Autumn.